UNSW Scientia Fellow Dr. Laurie Menviel who works with the Climate Change Research Centre performed numerical model simulations of climate conditions that highlighted the tight coupling between the Atlantic Meridional Overturning Circulation and sea-ice cover in the Norwegian Sea. "To reach this conclusion, we looked at specific organic molecules in a sediment core from the southern Norwegian Sea, one of which was produced by algae that live in sea ice and others that were produced by organisms living in open, ice-free waters thousands of years ago." Dr. Menviel says. 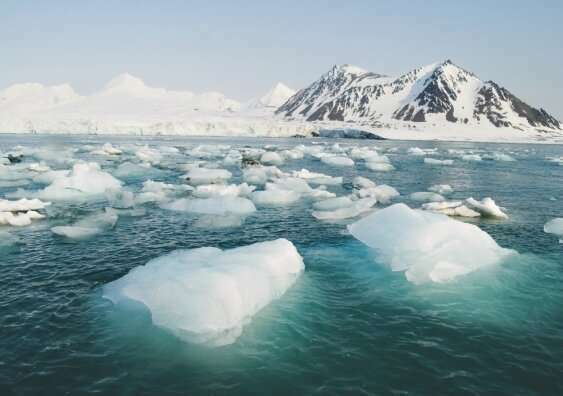 The data suggest that there were substantial changes in the sea ice cover in the southern Norwegian Sea between 32,000 and 40,000 years ago, according to Dr. Sadatzki. "Most extensive sea ice conditions occurred at the onsets and early parts of cold periods over Greenland and the most pronounced open-ocean conditions occurred at the onsets of the abrupt changes to warm periods over Greenland," he says. Dr. Menviel says that the transient numerical simulations she performed highlighted the link between past changes in sea-ice in the Norwegian Sea, and the large-scale Atlantic meridional oceanic circulation. "This provided us with an indication of the sensitivity of the system and showed the interplay between sea ice in this area, the oceanic circulation and climate," she says. "Our results form a major step forward in our understanding of abrupt climate changes," Dr. Sadatzki says.